In the Editorial for Issue 248 I reported on the shocking, premature death (age 46) of my partner’s youngest daughter Kate on 16 June, within two weeks of diagnosis, admission to UCL and commencement of chemotherapy treatment for Acute Myeloid Leukemia (AML). Profound thanks to readers and friends who emailed their condolences. Kate’s son Connor’s partner Coral gave birth on 14 August to a healthy baby boy - Isaac Matthew Partridge – a silver lining? In Issue 248 I also reported that my partner Mike Howell and I attended a Dinner Party at the House of Lords as a prequel to the transformational New Horizons in Water Science Conference held on 14 July. Dr Peter Fisher MBBChir FRCP FFHom aged 67, while cycling in work in London was killed in a cycling accident on 15 August barely one month after we had met up and updated each other about our work while on the House of Parliament tour on 14 July – Tribute Obituary to his work and life is published in Issue 249. Our heartfelt condolences are extended to numerous friends and colleagues in the PH Online community who have also been bereaved. The news media endlessly reports about shortcomings of the NHS or the US healthcare model: limited resources, shortage of staff and equipment, no joined-up social care to medical care, failure to provide the latest medicines and so on. What is almost never commented upon are the fundamental flaws in the structure of the healthcare model which involves the patients – us – visiting our GPs and then being referred to conventional treatment, which generally involves treatment options including: prescription medication, scans, diagnostic tests, surgical procedures including organ transplants, by-pass operations and other treatments such as radiotherapy or chemotherapy in the case of cancer. What is almost never mentioned in discussions about improving our health and therefore of the health service is that the huge number of generally non-invasive and non-toxic diverse alternative and complementary treatments which are completely lacking from the available treatment options from all but the rarest medical practices. These include the entire repertoire of treatments and medicines from Ayurvedic, Chinese Herbal, Naturopathic Nutritional Medicine, Bodywork disciplines such as Massage, Osteopathy, and Healing Psychological Therapies. “Using loaded labels such as ‘cancer’ can make patients more worried, the authors say, which can cause them to choose more aggressive management options - with more risk of harm. “A change in terminology could also “help shift clinicians’ perspectives and enable them to feel more comfortable recommending less invasive options to patients” - but any change would need to be assessed for benefit and harm, they say. 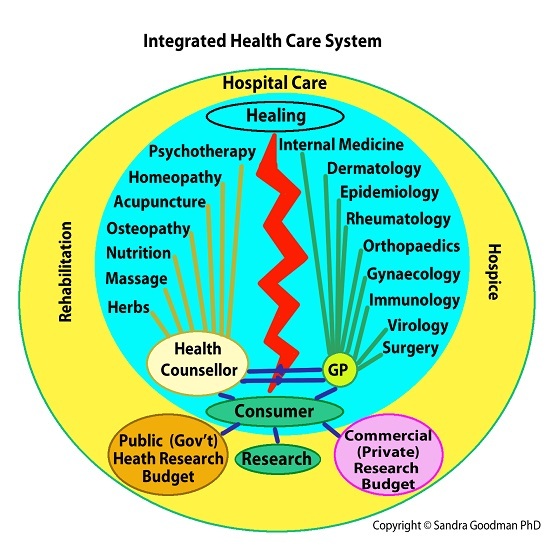 Layered over these structural issues are genuine disparities and at time profound / violent disagreements regarding what are the fundamental clinical root causes of many illnesses - cancer, heart disease, CFS/ME, obesity – and the safety of protective health practices such as vaccinations. Often these opposing medical / scientific clinical arguments occur over decades and may surface in the public domain when recommendations for public health issues change drastically. A very few examples include cholesterol being the cause of heart disease (countered with unimpeachable evidence by erudite cholesterol skeptics such as Uffe Ravnskov MD PhD of The Cholesterol Mythsfame, reviewed on PH Online), saturated fat being the main culprit in obesity, now almost universally supplanted with sugar being a main factor in the obesity / type 2 diabetes epidemic and cancer being either a genetic disease or the sequelae of mitochondrial dysfunction. In co-launching Positive Health magazine PH Online in 1994, my objective has always been to attempt to bring together conventional and alternative / complementary medicine into an Integrated Medicine healthcare structure. Some 25 years later, although this goal hasn’t yet been achieved, we continue to persevere in embodying such a positive healthcare system..
PH Online Issue 249 articles span the complete spectrum -mental and spiritual health, eye and dental health, thyroid care, pregnancy, fatigue, diabetes, colon health, juicing, craniosacral, neuromuscular, bodywork and innovative and structural approaches for back pain - and illustrate precisely how the complete panoply of health-enhancing treatments can promote optimal health and wellbeing.